Moreninha, se eu te pedisse is a “modinha”, a very widespread music genre in late XIXth Century Brazil, specially so in the Southeast region. This arrangement was created to sound like a melody, as if accompanied by a seven-string acoustic guitar, itself a very common instrument in southern Brazil. The indicated dynamics and tempos are quite precise, suggesting a clear way to perform it, however the entire song must be performed with some rubato, as a romantic lied. Within measures 11 through 19 we find a quotation of a flamenco song from the opera La vita Breve by Manuel de Falla, indicated in italics ( Despierta la novia, despierta, la mañana de las bodas! ), which changes between SAT voices. Spanish and Portuguese are similar languages, but their pronunciations are quite different; this difference must be made clear when performing. Between measures 22 and 30 there is a counter-melody movement between the main theme and the basses, imitating a typical Brazilian acoustic seven-string guitar in a dialogue with a mandolin or flute. The bass vocal line in particular should be performed with a lot of rubato, like an impromptu move. 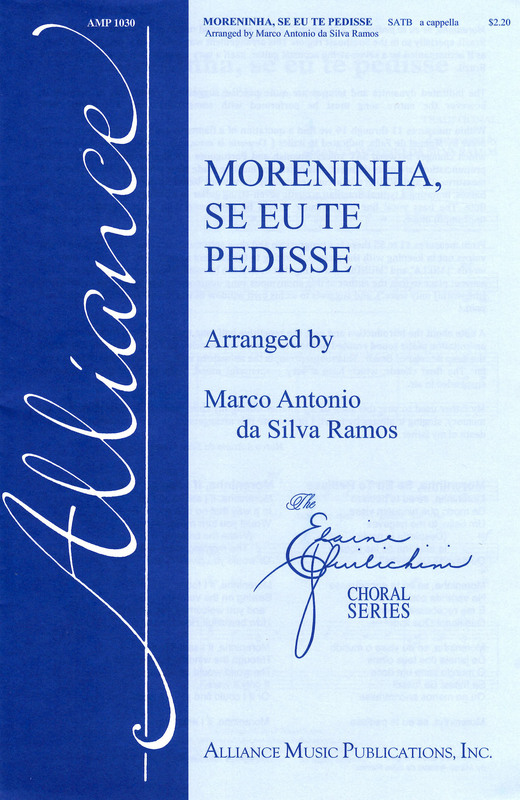 From measures 41 to 55 there is a progressive and slow accumulation of harmonic tension in the voices not in keeping with the melody, bringing to the clusters at measures 54 and 55, over the words “JANELA” and “MUNDO” indicating that even if the beloved “Moreninha” sees the world as a sweet place to live, the author of this anonymous song interrogates her, telling “se fosse” (“if it [the world] only were”), and suggests to us his own window of worldview regarding conflict and pain. A note about the introduction and end; the repetitive half tone that appears in both situations is an imitation of the sound emitted by the wheels of ox-car vehicles, still present to this day within the deep interior of Brazil . This sound prompts the animals to walk, and can be heard from very far. The final chords, which have a very suspenseful mood, must be treated as a memory suspended in air. My father used to sing this song to my mother during my childhood and so I retained it in my memory, singing it always by heart. I first wrote this arrangement in 1983, two years after the death of my father. Or would you give me one? The world would be so sweet!